A very happy publication day to Thomas Taylor and Marcus Sedgwick, whose graphic novel, Scarlett Hart: Monster Hunter is published today! Scarlett Hart, orphaned daughter of two legendary monster hunters, is determined to carry on in her parents’ goo-sodden footsteps—even if The Royal Academy for the Pursuit and Eradication of Zoological Eccentricities says she’s too young to fight perilous horrors. But whether it's creepy mummies or a horrid hound, Scarlett won’t back down, and with the help of her loyal butler and a lot of clever gadgets, she’s on the case. With her parent’s arch-rival, Count Stankovic, ratting her out to T.R.A.P.E.Z.E. and taking all the monster-catching rewards for himself, it’s getting hard for Scarlett to do what she was born to do. And when more monsters start mysteriously manifesting than ever before, Scarlett knows she has to get to the bottom of it and save the city... whatever the danger! 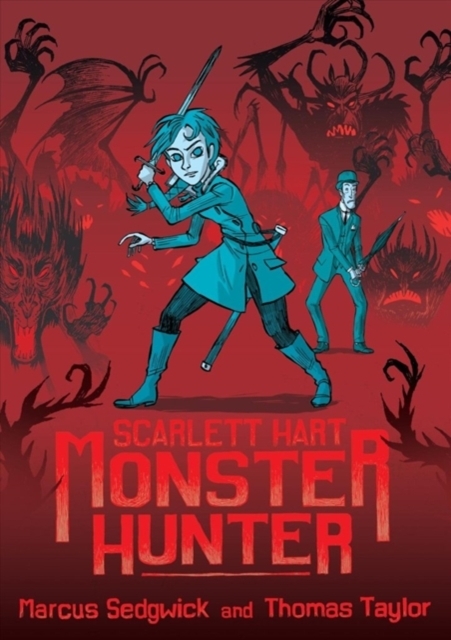 For anyone who likes books about monsters, Marcus Sedgwick (winner of the Printz Award) teams up with Thomas Taylor (illustrator of the original edition of Harry Potter and the Philosopher’s Stone) to create a rip-roaring romp full of hairy horrors, villainous villains: – introducing the world’s toughest monster hunter—Scarlett Hart!